One of England’s most tormented singers returns yet again after leaving us with a heart-breaking myocardial infarction in 2013. I mean this in a figurative way of course because in real life Matt Elliott is healthy as a horse. How else could The Calm Before be his seventeenth (!) album to date. Now let’s hear what this veteran of agony brings us this time, shall we? But before doing so, let me first say something brief about the album’s predecessor, Only Myocardial Infarction Can Break Your Heart (2013). Here Elliott upholded his usual level of lyrical sadness yet also shot his bolt for the remainder of the album with the over-demanding opener, ‘The Right To Cry’. Myocardial Infarction therefore differs from, let’s say, his Drinking Songs Trilogy on which the careful balancing of songs belongs to Elliott’s fundamentals. The Calm Before starts off with the haunting sound of a storm advancing a rough coastline from which is no escape. However just before you would expect heavy rain to come pouring down, gusts of wind to hit the beach and thunder to break loose Elliott dissects the impending chaos with his warm voice: “Here comes a storm. The dust and papers dance around the room. […] The sky is a painted viscous swirl of troubled hues. […] The branches rock and dance and creak and wave. We’re in for a storm”. In about 14 minutes Elliott comes to steam laying out his familiar patchwork of acoustics, strings, pianos and tops it off with some low-pitched drone. The intensity is put to ease with a sole acoustic song, cynically titled ‘The Feast of St. Stephen’ which is tranquil sneer towards the many wrongdoings in the name of Christianity, “I know that you are deaf to my complaints. That it’s an abuse to curse a child with your faith”. It’s true that up until this point The Calm Before offers nothing we haven’t heard before, yet it still offers enough tension to hold my attention. Alas the very familiar acoustic guitar loop that leads in ‘I Only Wanted to Give You Everything’ changes this for the worse as the album turn into an all-too-obvious repetition his latest five or so releases. For the umpteenth time Elliott’s works himself up to a height by underscoring his heartbreak by repeating the words ”…but you don’t love me” while he’s backed up by some eerie strings and choiring. Also the eerie double voiced singing is trotted out again on ‘Wings & Crown’ after which the album fizzles out with the soothing ‘The Allegory of the Cave’. The Calm Before brings a lot more refinement than its 2013 predecessor. The album is about a storm raging within and for the good part skillfully balances between peace and restlessness. Regrettably the cut-copy-paste soberness takes its toll after about twenty minutes in. Within the safety of his self-build comfortable splendor Elliott just doesn’t offer a lot of progress and, as a result, becomes spasmodically fauxmantic for my taste. I wouldn’t go so far as to say he’s in a rut. I have to admit that The Calm Before still is good enough to enjoy during late winter nights with a dram of Scotch. So all together I would say Matt Elliott still is a master of dark romanticism by simply doing what he does best. 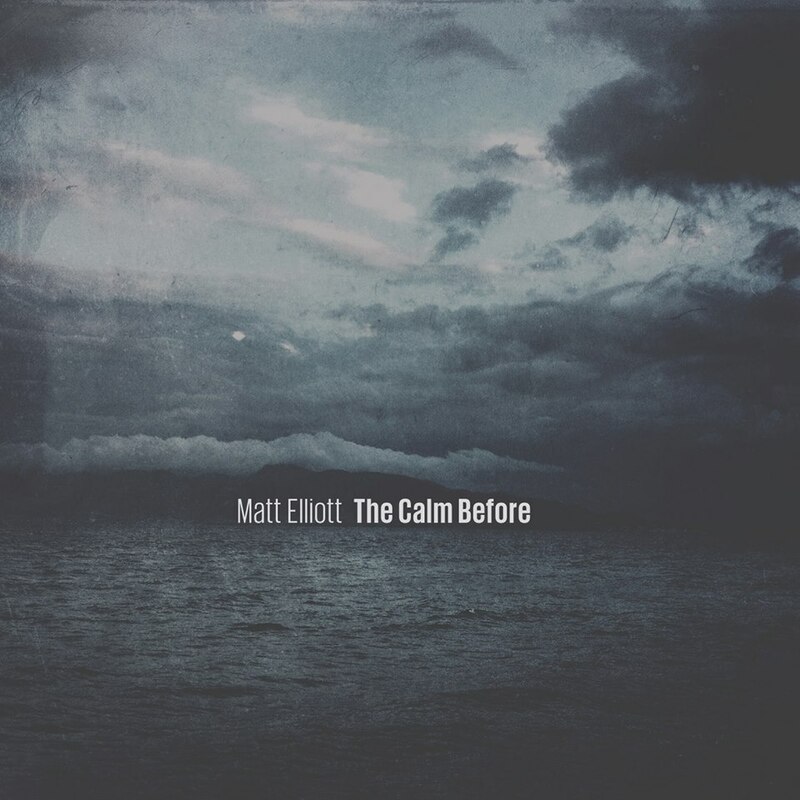 Matt Elliott ‘s, The Calm Before, is out now digitally and in brick and mortar stores on March 4th. This entry was posted in WRM and tagged 2016, cd, Dark folk music, Drinking Songs Trilogy, England, folk, Ici d’ailleurs, Matt Eliott, Only Myocardial Infarction Can Break Your Heart, review, singer songwriter, The Calm Before. Bookmark the permalink.